Pins, keys and retaining fasteners allow you to keep all manner of components and equipment attached securely to shafts, housings and other assemblies. We stock a wide range of retaining clip, key, fastener and pin sets for various hardware assembly jobs. What types of pins, keys and retaining fasteners are used for which components? Circlips, retaining rings or snap clips are ideal for keeping numerous types of hardware components fitted and attached to shafts or housings. They typically feature an open-ended/horseshoe-shaped circular metal ring cli; this design gives them a spring-like gripping action for better purchase. Snap clips and circlips can be bought as either internal or external types; internal versions are designed to fit inside a cylindrical bore, groove or housing and exert pressure outwards, while external circlips snap to the outside of a cylinder or shaft. Many C-shaped circlips require specialised circlip pliers to install and remove, although we also sell E-shaped variants (E-clips) which do not. Clevis pins are simple fasteners consisting of a head, a shank and hole. The hole passes through the tail end of the shank, allowing for another piece - called the retaining clip, or R-clip - to be inserted, thus securing the clevis pin. 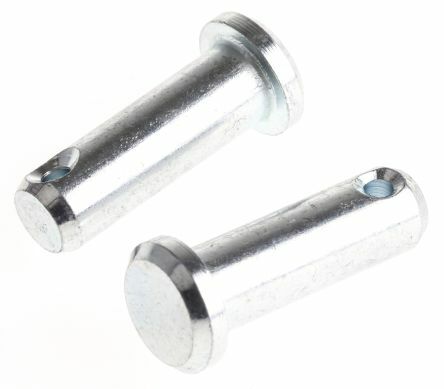 Split pins are a light-duty type of basic metal fastener, often found holding shafts and similar components in place, or keeping machinery aligned. They feature an eyelet to enable various attachments, and generally require the use of pliers or other manipulating tools to bend out the two separate tines of the pin once it has been inserted through a suitably sized hole. Spring pins or (slotted spring tension pins) comprise a single coil of spring steel with an open slot cut down one side. 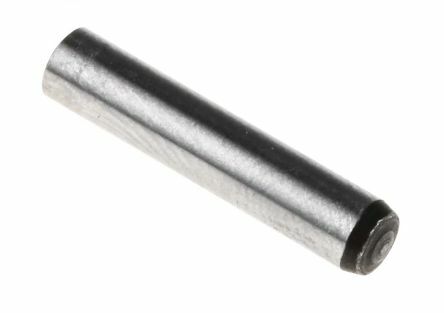 This is designed to allow the spring pin to reduce in diameter as its driven into a hole, creating a more robust retaining assembly than a standard steel dowel or split pin. Additionally, we always stock a wide variety of multi-piece retaining pin and key kits, as well as several types of push-on fasteners for smooth linear shafts. Youll also find many shapes and sizes of dowel pins and individual steel feather keys on sale in a selection of useful lengths and diameters. Imperial size clevis pins and retaining clips manufactured from mild steel and bright zinc plated for corrosion resistance. Although mild steel retaining clips will maintain their shape. Clevis Pin and Retaining Clip are sold separately. To BS46 part 3Mild steel, unhardenedStandard metric pin taper of 1-in-50.